Plan A, if you recall, was to freeze the highly contaminated water at the head of the trench right outside the Reactor 2 turbine building (Shaft A, on the northeast corner of the turbine building) to create an ice plug by placing several freezing pipes in the trench. Why is a plug needed? 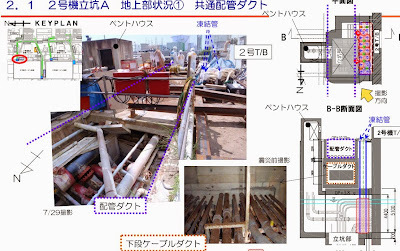 Because TEPCO wants to drain the highly contaminated water from the trench. So, on to Plan B. 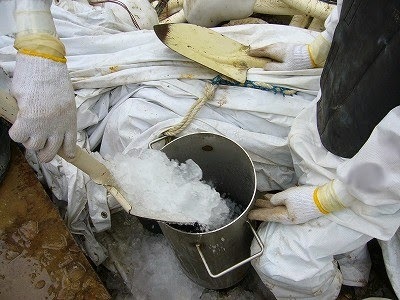 Plan B ran into trouble almost as soon as it started in late July, when crushed dry ice clogged the pipe in early August and crushed ice was seen floating around on the water surface (see photo). In the end, laws of physics prevailed and the contaminated water did not completely freeze, as TEPCO finally admitted, albeit in a very convoluted way in their report to Nuclear Regulation Authority on August 19, 2014 (Japanese only, PDF). 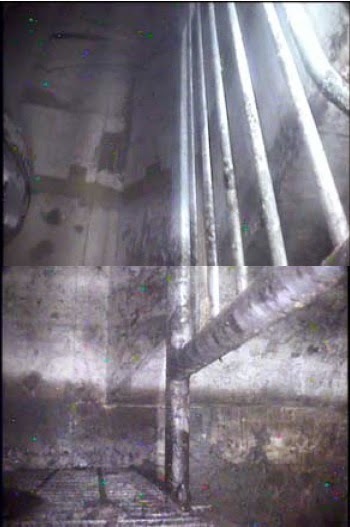 The report by TEPCO claims that 92% of the ice plug was formed in the Reactor 2 Shaft A. 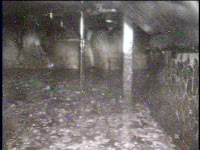 Well, a failure is a failure, as TEPCO admits the water continues to flow from the turbine building into the trench even at a faster speed now that the opening is narrower. What's worse, in the open duct that TEPCO dug at a different location (southwest corner of the Reactor 2 turbine building), the water hasn't frozen at all despite 2 months of effort using the freezing pipes. So now, time for Plan C.
So what is Plan C? 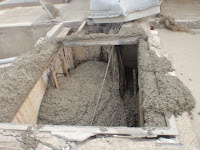 Use some (yet to be determined) type(s) of filler to completely fill the trench head, while the water is still running. Hmmm, diaper polymer, waterglass... where did I see this before? April 2011, at the water intake for Reactor 2, where pouring diaper polymer and concrete in the pit didn't stop the extremely contaminated water from pouring into the plant harbor. That water did not stop until waterglass was injected into the base rock UNDERNEATH the trench. I have a feeling they will soon need Plan D.
But why fight running water? Why can't they just pump out the water right there at the shaft? Or as one of the long-time readers of this blog "netudiant" suggested before, why not build a mobile ALPS on a barge inside the harbor?